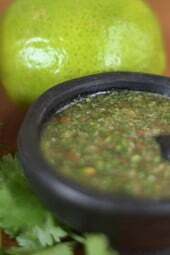 Aji picante is a spicy Colombian hot sauce served with soups, sancocho, stews, rice, beans, empanadas and more. Every Latin country has there own version of a spicy hot sauce, each unique and delicious. This is my mom’s recipe, she never measures when she cooks so it was a bit tricky getting her measurements right. A little goes a long way, you only need to add a few teaspoons to whatever you put this on. To save time, I used my mini food processor. Place all ingredients in a small food processor and pulse a few times. Shoot! 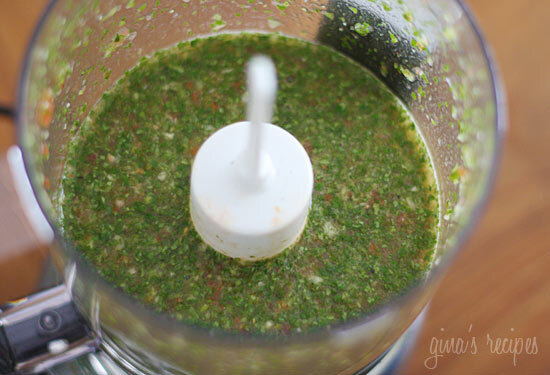 What happened with the flank steak marinade recipe that was with this recipe? I want to make that again but it’s gone…help! Is it in the cookbook? Sounds awesome, but what would you recommend using in place of the peppers for a total spice wimp. I can't even handle jalapeno…. Looks amazing! What kind of vinegar should I use? I use your recipes 3-4 times a week. At least! I could post on every recipe, but I decided to comment on this one because we LOVE your aji picante sauce!! I make double batches and freeze what we don't use that week to use later. And I put it in baby food jars and give it away as gifts. Delish! We can't WAIT for your cookbook to come out! Thanks for all the hard work you put into these recipes. We are loving them. I've been making your recipes for a few years now. I just wanted to pipe in finally and say I love this sauce! I made it originally to go with the Carne Guisada but I've been putting it on everything even after the stew was long gone. I will definitely be making this over and over again! Thanks! Made this for my husband with the Carne Guisada latin stew and we both loved it! I added a clove of garlic to the salsa just cause I love garlic 🙂 thanks so much for sharing, I love your recipes Gina! This is an excellent pairing with the guisada – so amazingly good. I want to make this tonight but I dont have peppers, can I use hot sauce, or hot pepper flakes or srichihi? 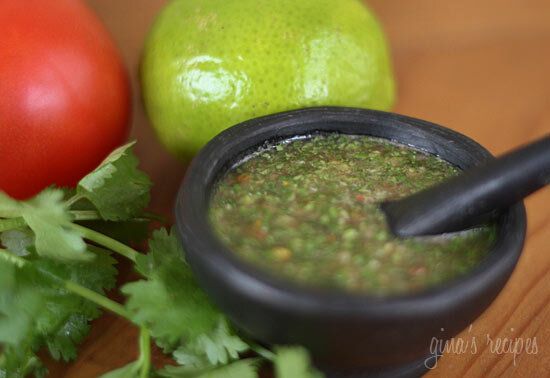 Just made this to go with the Carne Guisada that's simmering away…snuck a taste and wow! It's delicious! Can't wait to pair them together! Your recipes are too die for. They are delicious, and I'm so happy to have found your blog that has helped fit right in with my healthier lifestyle. By the way, you made me porud with this recipe. I am 100% COLOMBIAN and I approve!!! Yes, you can puree it in a blender. Just don't blend it for too long. Gina – thanks for this fantastic recipe. I made this along with your Fiesta Lime Rice and Cheddar Jalapeno Chicken. A truly amazing meal (except for the part where I was careless with the habaneros and had to soak my hand in yogurt! Gloves next time for sure). lol, no not too nice! Welcome, hope you like everything! Mine were green, they might get hotter when red! You could use any hot pepper, jalapenos would work too. Gina, I bought the ingredients to try this, but got scared a little. Your recipe for the Habanero Cilantro Lime Rice doesn't have any red in it. My grocery store only had RED habanero chile peppers. Is this right??? We do like the spicy sauces, but I don't want to kill myself with this stuff either. The website I just looked up as the red habanero among the top 5 hottest peppers. Please let me know which color of pepper is to be used in this recipe. Thanks!!! Great! how did you change your font! I'm Colombian and my mom always says "al calculo del ojo" when cooking, she never measures anything. I guess that's the Colombian secret 🙂 Thank you for this blog! Rebecca, crab and shrimp empanadas are great too, I'll try to post them soon! My mom always makes pavlova's but I've never attempted it. Thanks for the inspiration – this is so pretty! I had to bookmark this one. No, sofrito is something you cook with, where as aji is a condiment you eat raw, add to your cooked food. Hot sauce basically. The longer this sits in the fridge, the better it tastes. So make this ahead of time. Great with bbq meats! Here via Kim's blog (Stirring The Pot) where I saw your link to this recipe. I love aji sauce. I first came across it in Steven Raichlen's Planet Barbecue! I like your blog, great photography and content. I have some friends who love this recipe! Sounds spicy hot and delicious! This is very similar to sofrito, yes? Yum! THis looks fabulous. I love spicy food. P.S. We had company over for empanadas and one of our guests doesn't eat red meat, so I made up a chicken empanada and it was awesome. It was the first time I created something that was good, so thanks for being the inspiration!!! I used white, but red wine would work too. Hi Gina, this looks great (as always). What kind of vinager do you use when you make it? These kind of home made hot sauce are healthy and tasty.I like the flavor of this sauce too. Good question Kassie, it keeps a while. At least 1 week if not longer. I'm sure it would freeze fine! Great way to use up that extra cilantro you don't know what to do with!! I should mention, if you like your food super hot, add more peppers. Scott bonnets are super hot! You coups also use jalapeño peppers, red pepper flakes would even do. I love the southern recipes but don't care for the Morocan recipes. Send more because you are great. WW is awesome & we need all the help we can get. Ooooo..I want to try this because my husband has been all about adding hot sauce to things, and this is a healthier way to do it! Question: how long does it keep for in the fridge? Can you freeze it? Love hot sauce and this sounds wonderful! Would go with so many foods! This looks soooo good, and versatile. Thanks as always Gina!! !